The Smith River in Franklin and Henry Counties is one of the state’s most unique trout fisheries. The cold water released from Philpott Dam provides miles of quality trout water and offers excellent fishing opportunities throughout the year. Approximately 31 miles from Philpott Dam downstream to State Route 636 (Mitchell Bridge) are special regulation brown trout waters. Two sections of the Smith are designated as put-and-take stocked waters and provide opportunities to catch rainbow trout. Downstream of the special regulation section, anglers can expect to catch smallmouth bass, rock bass, and sunfish as the Smith makes its way into North Carolina. Note: Water levels in the Smith River fluctuate daily due to hydro-electric generation from Philpott Dam. Before fishing or paddling the Smith, call (276)629-2432 for the generation schedule for Philpott Dam. The Smith River may be accessed from State Route 57, as well as from multiple secondary routes located off of 57. Henry County Parks & Recreation and the Dan River Basin Association operate nine public access points along the Smith. For more information on these access points contact Henry County Parks & Recreation or the Martinsville Visitor Center. Starting at Philpott Dam, downstream approximately 3.3 miles to the confluence with Town Creek, is designated stocked trout waters. This section, of the Smith River is classified as “Category B Stocked Trout Water”, is stocked with rainbow trout 5 times from October 1st through June 15th. Another section, classified as “Category A Stocked Trout Waters”, starting in the North Bassett area downstream approximately 9.5 miles to below Fieldale is stocked with rainbow trout 8 times from October 1st through June 15th. Both stocked trout areas require a stocked trout license in addition to a state freshwater fishing license. Designated stocked trout areas of the Smith River display signs like the one below. From Philpott Dam downstream approximately 31 miles is designated “Special Regulation Brown Trout Water”. Brown trout between 10 and 24 inches must be released if caught in this section. There is an abundance of brown trout 6 to 12 inches in length in the upper portions of the Smith River beginning near the Philpott Dam. Traveling downstream from the Philpott Dam brown trout abundance decreases, but trout size increases. The Smith River below Martinsville Dam offers the best chance to catch larger brown trout. Brown trout 12 to 18 inches are common in this section and hooking into a brown over 20 inches is possible. Downstream from the Marrowbone access point the brown trout begin to fade and smallmouth bass become more prevalent. Regulation signs like the one below are posted throughout the 31 mile section of the Smith River below Philpott Dam. 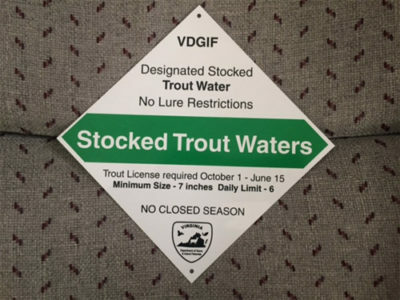 A trout license, in addition to the statewide freshwater fishing license, is required to fish in the designated, “put-and-take” stocked trout sections from October 1st through June 15th. Keep in mind that the put-and-take waters overlap with the special regulation section. Therefore, the special regulations on brown trout (no brown trout between 10-24 inches and only one over 24 inches) still apply in the put-and-take sections. The special regulation section of the Smith River is from the Philpott Dam downstream approximately 31 miles to State Route 636 crossing (Mitchell Bridge). 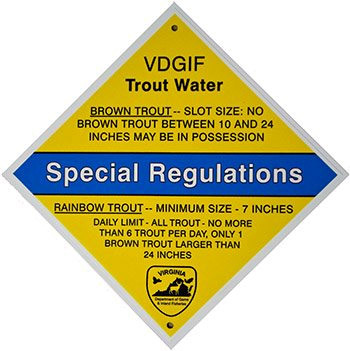 In this special regulation section, all brown trout 10 to 24 inches must be released immediately, and only one brown trout over 24 inches may be kept. The minimum length for all trout is 7 inches, with a combined creel of 6-fish/day. The use of bait and any combination of artificial lures is allowed throughout this section.